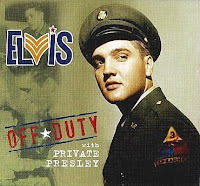 While visiting London about a month ago to see Elvis Presley In Concert, I picked up little book/CD combo titled Off Duty With Private Elvis. Not much bigger than a double CD jewel case I wasn't expecting too much, but as it turned out it was well worth its money. This book/CD was recently released by the UK based Memphis Recording Service, to celebrate the 50th anniversary of Elvis Presley’s discharge from the army in 1960. The book is a little beauty in itself, featuring many rare photographs from Elvis' time in uniform. The photos I found the most interesting were the ones obviously taken by soldiers serving together with Elvis. The ten or so shots of Elvis "shoppin' around" at the post exchange (PX) made me think of my own time in the military abroad, and how important it was to be able to buy articles from home, like magazines, candy and other stuff. Obviously Elvis thought so as well. As for the CD, it features four of the five master recordings from June 1958 as well as some 30 unreleased home recordings recorded privately by Elvis and friend while stationed in US and Germany. To be honest, there is a lot of distortion at times, and this is only for die hard collectors. That said, it's not every day you get to listen to Elvis doing a medley of "Que Sera Sera/Hound Dog." I won't bother with any more details, instead refering to Piers Beagley's excellent review at the Elvis Information Network website. Let me just end by saying that I find Off Duty With Private Presley much more praiseworthy than some of the (very expensive) book/CD combos put out by FTD. One of the reasons I started Elvis Today two and a half years ago was the lack of blogs about Elvis. Granted, there were a lot of sites about Elvis, but they were (and still are) more oriented towards news and seldom offers a more personal perspective. The situation is still the same. Do a google search for "Elvis" and "blog" and you'll find just a few Elvis blogs, some of which haven't even been updated for a while. It's a bit surprising, giving all the fans out there who, like me, have Elvis taking part in their lives on a daily basis. In fact, one of the few Elvis blogs that I've found, and also like the best, is one that isn't even all about Elvis. Called The Film Frontier it offers "new posts every weekend on pop culture/entertainment topics such as Star Trek, Superman, Star Wars, and Elvis Presley." The guy running The Film Frontier calls himself Tygrrius and I often find myself being in complete agreement with his opinions when it comes to things having to do with Elvis. In fact, reading his latest post, A refreshing portrait of Elvis after the Army, had me thinking 1) why didn't I think of writing something about that and 2) a shame he doesn't write solely about Elvis (although I enjoy his other topics as well). Enough said. Go visit The Film Frontier and see for yourself what I mean. And while you're at it, check out his excellent reviews of FTD albums at the Elvis Australia site. I always enjoy reading interviews with studio musicians who worked with Elvis. After all, these are the guys who can give you a first hand account about the recording sessions and shed some light on stuff you've been wondering about listening to the albums. "That happened about 4 o'clock in the morning and I'd been up since 8 o'clock the previous day. And it was a long blues, and you have to realize that blues is the most boring music in the world for a bass player. It's just the same thing over and over and over again. So I was really tired and my eyes were closing and he said, "Wake up, Putt!" (laughs). I was sitting on a stool with my feet propped up and my eyes shut and I was almost nodding off. But I didn't miss a note! (laughs)"
That one Norbert Putnam remembers quite clearly, but there are other moments or songs he's forgotten. But as it was about 40 years since these recordings took place, that doesn't surpirse me that much. For starters, he doesn't recollect doing "Whole Lotta Shakin' Goin' On" and comments,"That was probably a jam, wasn't it?" And when he's asked about what he felt about songs such as "Life" and "This Is Our Dance" being done, he answers, "I don't remember those songs." I guess he can be forgiven. It's also amusing reading that he calls the album Elvis Country "The Country Classics album, or whatever that was called" and asking the interviewer "When was it I played with Elvis?" while answering a question about how he felt getting a call from Felton to play on the session. I suppose sometimes it's easy to forget that musicians like Norbert Putnam worked with a lot of artists. And though they probably were thrilled to play on an Elvis session, when it happened, it was just another day on the job. There wasn't any reason for them to sit down after a session and write down how it was to play with Elvis or how many takes he did on any particular song. Still, I can't help thinking that it's a little bit funny that the fans know more than the musicians do about the name of the songs, what dates they were recorded and so on. But Norbert Putnam and his fellow musicians have the memories, and I'm always grateful when they share them with us. If the box set A Golden Celebration from 1984 had included a 1976 soundboard concert like the one recorded on October 17 in Minneapolis I would've been excited, to say the least. When released as A Minnesota Moment 26 years later it's just another one in a row of soundboards from 1976 made available by FTD. Or maybe not. Comparing it to the concert featured on New Haven '76 from July 30, is like night and day. On the latter Elvis sounds painfully exhausted and out of breath, while on A Minnesota Moment we get to listen to an Elvis that is there to sing and entertain, not just to go through the motions. In fact, it's a pretty good show. Elvis seems to be in a good mood, sings well and gives some solid performances. During this particular tour he used "Steamroller Blues" once again, and in Minneapolis he delivers a great version. Elvis is clearly having fun with "One Night" and "It's Now Or Never" is another enjoyable performance. I must also mention two of the bonus songs (An Elvis album without bonus songs? Come on! ), featuring Elvis on guitar. "Blue Christmas" is a bluesy rendition, recorded in Dayton, Ohio, on October 26. The last track on the album, "That's All Right," is from the same show, delivered at a supercharged pace after a request for "Lonesome Cowboy!" 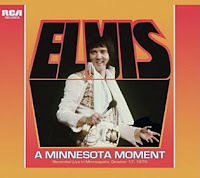 All in all, Joan Deary (Elvis' record producer at the time) could've done worse that included a show like the one recorded live on October 17, 1976 at The Metropolitan Sports Center, Minneapolis, Minnesota on the A Golden Celebration box set. Why she didn't is anybodies guess. PS: I just have to mention the terrible photoshop job done on the cover around Elvis' left arm. Is that sloppy, or what? 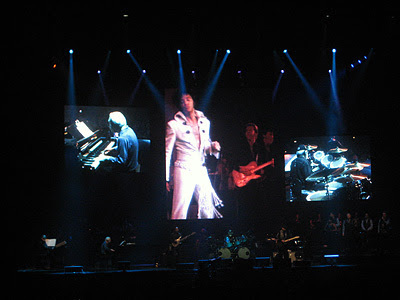 One week after the concert in London, the thing I remember the most about Elvis Presley In Concert was the incredible response from the audience. This was especially true during the second act when show stoppers such as "Suspicious Minds" and "An American Trilogy" earned standing ovations from every single soul in the arena, yours truly included. Another moment that comes to mind was the bald guy two rows in front of me wearing one of those shirts Elvis fancied during rehearsals for his August 1970 Las Vegas engagement. When Elvis sang the part about "gazed at your bald head and wished you had hair" on the big screen, his buddies seated beside him pointed at his head and all of them had a great laugh. I also remembered feeling incredible good, thinking once again, how lucky I am being a fan and what Elvis means to me. And, judging by the people all around me, I wasn't the only one having those kind of thoughts. As for the show itself, I felt it was more "in sync" than when I saw it the last time, in 2000. Elvis' voice and the musicians sounded very coordinated and never out of time. In other words, the illusion that Elvis sang "live" was a very real one. But maybe this should come as no big surprise. The concert was part of the sixth tour of Europe, so the band should feel very much at ease with the concept by now. Which leads me to the only bit of criticism I have about the whole show: the song lineup. Although a very strong one, it differs little from the one used during earlier tours. Granted, there's only a few movies and television specials to choose from, but they include a lot of material (released and unreleased) that hasn't been used. I for one would love to see "I Just Can't Help Believin'," "Patch It Up," and "Walk A Mile In My Shoes" from That's The Way It Is. And why isn't more footage from Elvis On Tour than "How Great Thou Art" and "Sweet, Sweet Spirit" adapted to the show? And while I'll at it, wouldn't it be cool if Act 1 was the Aloha show and Act 2 a concert from August 1970? "Who but the legendary Elvis Presley, his outstanding bandmates and his incomparable fans could make such an amazing thing happen? Elvis was the best. He surrounded himself with the best singers and players. Together, they performed for the best fans anyone could ever dream of having. Elvis said it then and it's still true today: "You're a fantastic audience. Thankyouverymuch." Movie showing the last minute of "Suspicious Minds." We planned it carefully: Bought our tickets months ahead, booked the flight well in advance and left our hotel in central London two hours before the concert was to begin in the Wembley Arena. Despite all this me and my wife almost missed Elvis Presley In Concert thanks to the city's public transportation system. Not only was the underground station where we were supposed to take "the tube" to the arena closed due to an emergency (we never found out what the emergency was). For whatever reason the fastest line to Wembley was also out of order that evening. And on top of that, the replacement buses didn't arrive. But thanks to a guy dressed like Elvis that we talked to on the street (wasn't that hard guessing where he was heading) we soon found ourselves in a taxi together with Gary Aron – The Scottish Voice of Elvis, his fiancée, and another couple that, hearing we had come all the way from Sweden, "apologized, on behalf of England." Funny how Elvis can bring together people that way. Despite being in a hurry, we had a pleasant drive to the arena, chatting about things having to do with the King, if we had been to Graceland and if we'd seen the show before, things like that. But even though the cab driver pushed the pedal to the metal, we arrived about a quarter of an hour late to the arena. 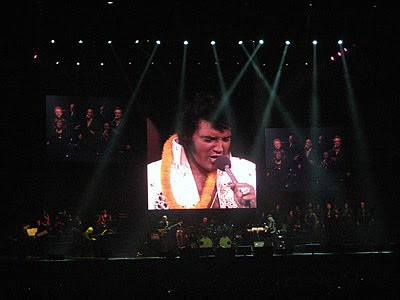 So from the taxi we ran, and were shown to our seats as Elvis belted out "Steamroller Blues" on the big screen. I looked around me, amazed by the number of people in the audience, then turned my attention to the stage and enjoyed the show. More about that in my next post.